"41AN34, 93, 9" by Timothy K. Perttula and Robert Z. Selden Jr.
DECORATION: The jar is decorated on the rim with incised triangles filled with tool punctations and near vertical incised panels filled with tool punctations. The near vertical incised panels and incised triangles are divided by a single diagonal incised line, and the bottom of the incised-punctated triangles and panels is defined by a single horizontal incised line. 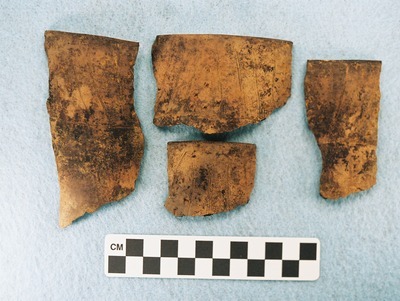 Rim sherds from a Maydelle Incised jar in Feature 93 (Vessel 9) at the Lang Pasture site.